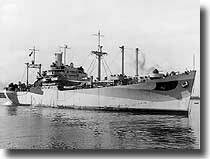 USS Mount Hood enjoyed but a very short life, this 13,910 ton ammunition ship was built in North Carolina at Wilmington, then converted for Naval service at Norfolk Virginia in July 1944. She then transited the Panama Canal in August, loaded with ammunition for the forces fighting in the Pacific. On the morning of the 10th. 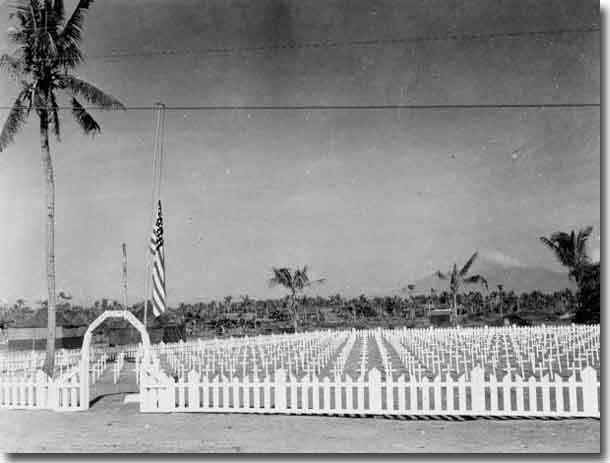 of November 1944, the ship was moored at the massive forward base of Manus in the Admiralty Islands. At that stage of the Pacific war, this base was at the crossroads to the world, sitting almost on the equator, both the Leyte and Lingayen landings had staged from here in October and December 1944. 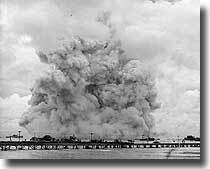 Mount Hood's cargo of explosives suddenly detonated with a massive blast, and the ship was totally destroyed, killing all on board or working the ship at the time. Damage and casualities to both Mount Hood and ships anchored up to 2,000 yards away were massive, 45 dead, 327 missing and another 371 injured. On the day in question, ammunition was both being received on board and delivered to other ships, all five holds were being worked at the same time. About 3,800 tons of assorted ammunition was onboard, and included:- bombs, projectiles, fixed ammunition rockets, smokeless powder, aerial depth bombs, and nose fuses. Torpex filled depth bombs were being hoisted onboard. 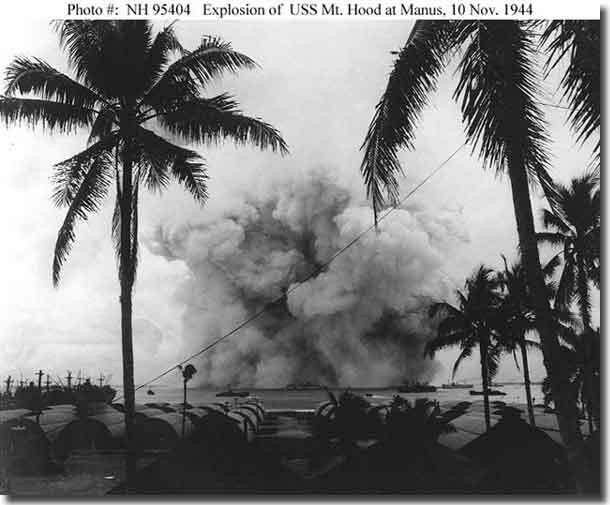 Enemy action was ruled at as a cause of this disaster, the most probable reason for the explosion appears to have been rough handling of ammunition being loaded or unloaded, and it seems likely that the accident was caused by the detonation of Torpex filled Depth bombs being loaded into number 4 and 5 holds. Detonation could have been set off with a bomb on its way down to a hold striking a hatch, or the careless dropping of it into a hold. Eye witness reports indicated that at first a small explosion about the size a small bomb might make was observed, a few seconds later, the main explosion followed, flame and smoke extended for about 100 feet in radius, and quickly rose to 7,000 feet. The main naval fleets were all absent at the time of this horrific explosion, but some 200 other ships were in harbour, mostly auxiliaries, cargo ships, transports, depot ships and tankers etc. Carl Hughes on board the Liberty ship William Mc Guffey reported seeing a 2 man Midget Submarine fire a torpedo into Mount Hood, but post war, theJapanese Naval authorities have denied any Midget Submarine operated in the Manus area at the time of this explosion on the 10th. of November in 1944. The official inquiry ruled out enemy action as the reason for Mount Hood's destruction, it does seem that careless handling of a torpex filled depth bomb was the real culprit for this terrible accident, destroying a ship only 4 months old with a great loss of life.